Perched on a crest overlooking the intersection of Mulholland Drive and Laurel Canyon Boulevard, the Fitzpatrick-Leland House imitates the hilltop, cascading down three stories and spreading out where it meets the earth. It was a large lot for architect Rudolph Schindler, who designed the house in 1936 as a spec for real estate developer Clifton Fitzpatrick. 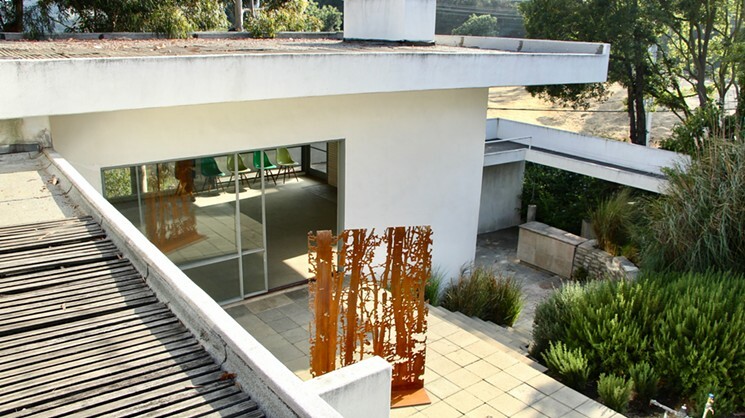 The L-shaped structure incorporates interlocking volumes radiating from its core and blurring the line between indoors and outdoors, just some of the traits associated with Schindler’s work. Davies associates the stencil with Schindler’s units, blocky precut furnishings made of wood that could be manipulated by homeowners to fit their needs. Like Schindler, Davies is an immigrant, arriving in Los Angeles a few years ago from Sydney, Australia. 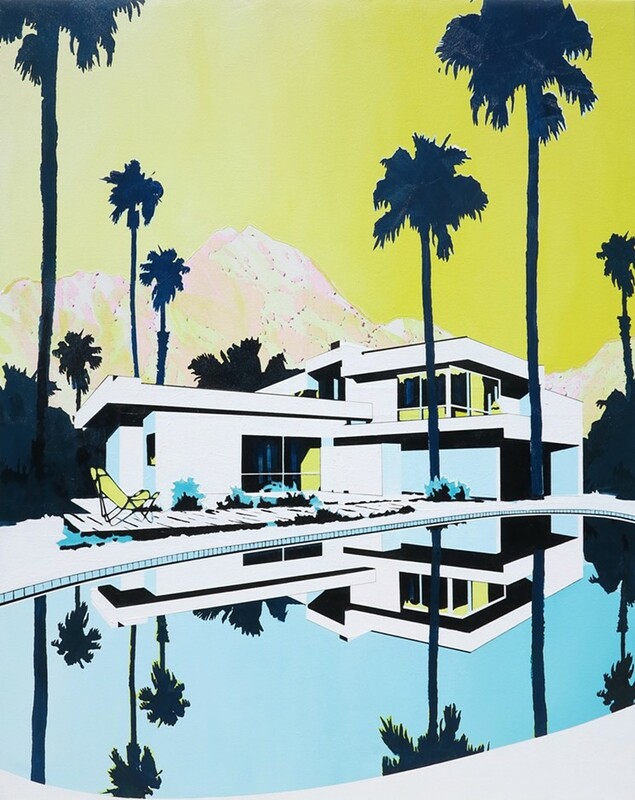 He has shown in galleries on three continents and is included in public and corporate collections such as Rothschild, Historic Houses Trust and the Scottsdale Museum of Contemporary Art. Midcentury modern homes like the Fitzpatrick-Leland, or Sydney’s Seidler House, are common fixtures in his work, and he hopes to eventually include Philip Johnson’s Glass House or even one of Frank Lloyd Wright’s Los Angeles buildings. Wright had a profound impact on both Davies and Schindler, who landed in the United States from Austria in 1914. Schindler found his way to Taliesin, where he studied under Wright and oversaw the construction of the Hollyhock House in Hollywood while Wright was in Tokyo working on the Imperial Hotel. It was around this time that Schindler built the iconic Kings Road House in West Hollywood and invited his old schoolmate, Richard Neutra to join him there. 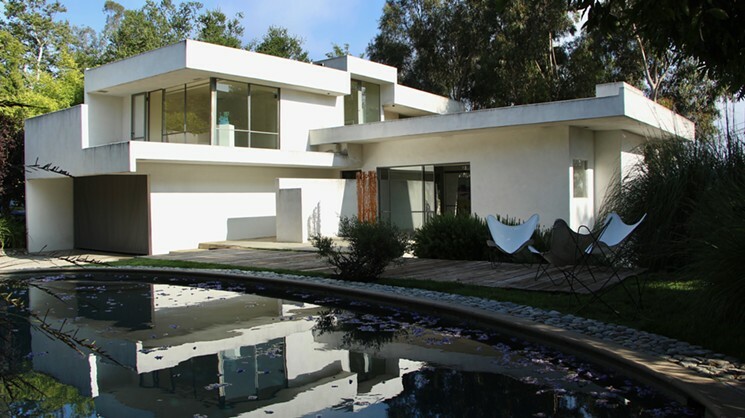 The two men became highly influential modernists, but following a contentious split in 1927, it was decades before Schindler was awarded the same recognition as Neutra, despite masterpieces like the Lovell Beach House in Newport Beach, Catalina Island’s Wolfe House and the Kings Road House, whose floor plan and use of cement slab made it one of the most forward-looking structures of its era. Like Schindler and Neutra, Davies attended Taliesin (West in Arizona), Wright’s school of architecture. The artist’s series of 24 gum bichromate photograms depict one of Wright’s Prairie-style structures with a watery wash that suggests paintings like Monet’s series of Rouen Cathedral, capturing various hours and attitudes. 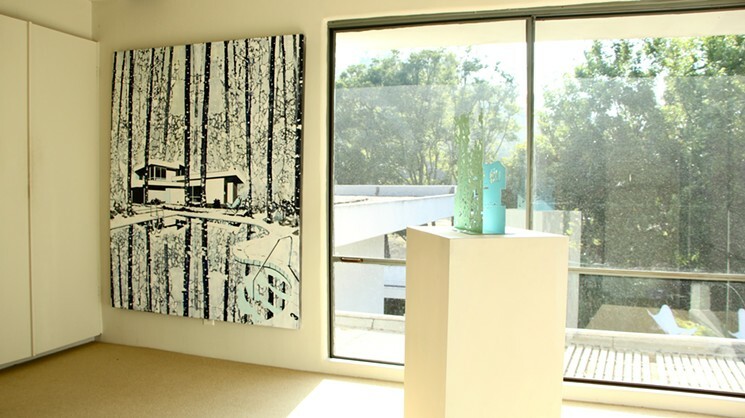 “Everything Loose Will Land in L.A. — Double Golden Gully” is a series of three paintings, one of which employs the stencil of Schindler’s house against a woodland background taken from a photo of Golden Gully, an area that played a part in Australia’s gold rush, which was triggered by the California Gold Rush in 1848.